I don’t imagine that many talks to astronomy clubs include quotations from Sartre and Wordsworth, as well as references to building a telephone to communicate with flying saucers. Our September talk by Dr Andy Martin from the University of Cambridge included these things and more. Andy works in the Faculty of Modern & Medieval Languages, but is also a surfer, writer and historian with an interest in science and philosophy. 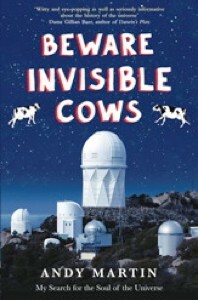 These latter interests prompted him to write a book called “Beware Invisible Cows” in which he describes a philosophical journey towards understanding how the universe began. This led him to visit the twin 10 metre telescopes at the Keck observatory in Hawaii. The mountain access road to the top of the mountain has limited visibility at times, as well as roaming cattle, hence the road sign which prompted the title of his book and talk to us. We were presented with a sort of ‘stream of consciousness’ about the different ways of seeing back in time – the mirrors on telescopes do this, because the light falling on them has a history; it’s the same as a person looking at their reflection in a mirror, they are looking at history, even though it is only a few nanoseconds back. Punctuating these reflections (no pun intended) were comments about Andy’s physicist twin brother who tried to build a device that could communicate with the ‘flying saucer’ that Andy had seen over his house! I didn’t understand the physical principles of this device, let alone believe in flying saucers, but it was an interesting (if somewhat bizarre) departure from the main theme of the talk. The mirrors of the Keck telescopes are used to look back in time, but they can only reach so far- there is a limit of about 380,000 years after the Big Bang where no electromagnetic radiation can be observed. However, Einstein predicted the existence of gravitational waves in his General Theory of Relativity and these should be detectable further back in time. These musings prompted Andy to visit the Laser Interferometer Gravitational-Wave Observatory (LIGO) based in Washington State, USA. This consists of an L shaped tube four kilometres long on each side that contains lasers and mirrors designed to detect the impact of a gravitational wave by changing the phase of two light beams interacting together (see http://www.ligo.caltech.edu/ for a proper explanation). Andy pointed out the problems caused by background vibrations from activities on earth, including large waves crashing on the shore miles away in California (prompting the surfers at LIGO to pack up for the day!). No gravitational waves have been detected so far, but the LISA space mission is in the offing which will increase the detection sensitivity by orders of magnitude. Andy concluded his talk with the words of Sartre and Wordsworth on the origins of the universe and finally with a piece of music by Ligeti (music used in 2001 A Space Odyssey) to illustrate the ‘noise’ of the universe. I’m very disappointed to have missed this talk – sounds like it was a bit “left field” compared to talks we’re used to! I have the book on order from Amazon though, so hopefully that will make up for having to be elsewhere on Wednesday!